Not too many companies can boast of the kind of history of the original Edison Company in New Jersey (above). But the history of YOUR business or your company is worth preserving! Company History Videos - and Books! Thomas Edison probably had it right: "I have not failed. I've just found 10,000 ways that won't work!" Most organizations struggle, at least at some stage of their growth. And the stories of companies, nonprofits, associations and schools which survive are often inspiring and usually stories worth telling. Are you thinking of telling the story of your organization or company in a video, or book, or both? 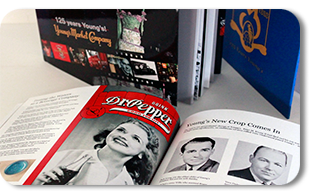 Part of other company history initiatives such as photo preservation, oral histories and company history books. Why not give Jane a call - number below right - and see if we can help your organization put together a history? If you are a nonprofit or a voluntary association then you rely on your benefactors and volunteers to function. Are you looking to report on progress to your stakeholders? A video is an ideal way to stay connected and ensure that you will have their support in the future. Your Story Here can help with all stages of the process from creating and outlining the concept, through budgeting and resource allocation, to production and final delivery. Why Choose Your Story Here for your Company History? 1. We are lean and efficient. We create in video or in print - or both. 2. We are flexible, easy to work with and we prefer a consultative, partnership approach. The client is the ultimate producer. 3. We specialize in historical subjects. We have won film awards for our documentaries, printed thousands of books, and almost all of our work involves interviews. 4. We specialize in historical images and digitizing and restoring historical images (at Your Story Here LLC we actually have our own photo restoration division). 5. For video, we shoot in HD and use high quality audio and lighting - but we do not have large crews and we do not have an expensive cost structure. 6. We also produce company-history-on-video and company history book add-ons such as web video and digital archives. So when it is time for you to create an organizational profile or a company history on video, call Jane on the number below. We have delighted hundreds of clients with our careful and caring video production and video editing work through all aspects of the process. We bring that same level of expertise and professionalism to company histories and organizational profiles on video. Get Our Bi-Monthly Email Newsletter with advice, stories & more about preserving personal & family history! "Our family has such joy in knowing that we have preserved Hazel's voice, her smile, and her stories on video. We have them to enjoy and share with our kids & their kids. Available now Orange County, LA and beyond! Copyright 2011-2017 | Your Story Here LLC.